Pouiseuille's breakthrough paved the way for the development of modern medicine as measuring viscosity became an important aspect of varieties of industries -- including biopharma, inks, foods, and oils. Measuring viscosity started to incorporate different applications as concepts began to account for the changes in the samples dependent on the shear rate. Capillary Viscometer: One of the oldest methods of measuring viscosity, the capillary viscometer measures the time between the volume of liquid/sample to pass through the length of the capillary tubes. Rotational Viscometer: Measures the torque required to revolve an object within the volume of liquid. Falling Sphere Viscometer: Measures the viscosity by dropping a sphere of a specific weight & density and measures the time it takes the sphere to reach designated junctures. Zahn Cup Method: Measures by observing the time it takes the volume of liquid to empty the cup though a small hole in the bottom of a container/cups. Vibrational Viscometer: By measuring the vibrational waves using a vibrating rod submerged in fluid, viscosity is calculated by analyzing the dampening of the vibration. VROC® technology promotes a different approach: a hybrid between microfluidic and micro-electro-mechanical-systems (MEMS) technologies. And because it is a microfluidic chip, users save a tremendous amount on samples. What separates VRPC technology and alternative viscometers? Sample Requirement: Microtechnology require just around 26 µl. In an application using the microVISC™, we were able to to save half of the measurement time & sample when compared to capillary viscometers. Access application note here. 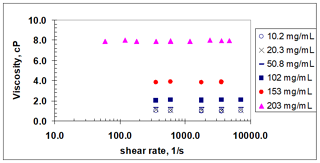 Shear Rates: From as low as .5 to as high as 1,400,000 s-1. 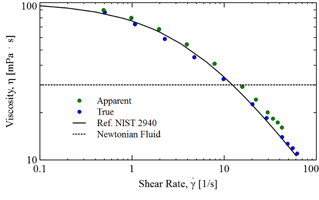 Newtonian vs. Non-Newtonian: Equipped with full control of shear rates, you are able to see if your fluid is Newtonian or non-Newtonian. In the figure above, the viscosity of a non-Newtonian standard decreases as shear rate increases. In the figure above, the NIST-standard's viscosity is not dependent to the increase in shear rate. If you have any questions regarding VROC technology or curious to learn more, click below! "Jean-Louis-Marie Poiseuille, French Physician" written by The Editors of Encyclopedia Britannica. Access article here. "The History of Poiseulle's Law" by Salvatore P. Sutera, Department of Mechanical Engineering, Washington University, St. Louis, Missouri. Access paper here.